Photo taken just after 'revision' work completed and after first good watering of the garden. I'll add some 'before' & 'after' photos soon. In the end the overall project (revision of the existing landscape and installation of new materials) created a uniquely beautiful, water-wise and sustainable front garden in Kensington. The owners are delighted with the results as was I! 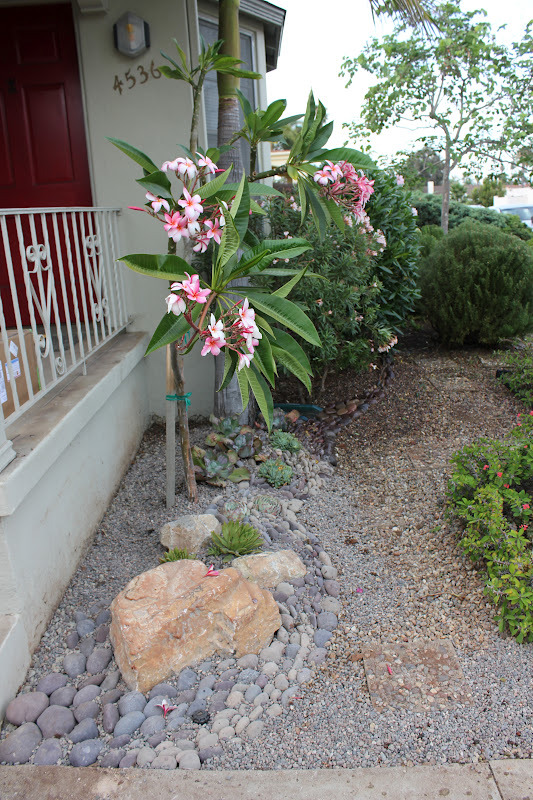 This image the reveals the new front area walkway w/ boulders installed on both sides of the path and smaller colorful rock inlaid around new & colorful Echeveria to go with the beautiful Plumeria which was already in bloom. Note here: a thorough watering of the new garden 'still in progress' in this early shot. The project included re-locating many of the existing plants to more advantageous locations, installation of new boulders, colorful beach pebble stone, and decorative gravel mulch. Plus, the trees and shrubbery were pruned to create definition and add movement and complimentary shapes to the overall composition.